Sky, Jeff, Dave, Amar, and I skied Baker today via the Squak/Easton. Decent snow on the headwall, but lower down hard, 6in runnels provided nasty survival skiing. The last 1500 feet to camp were the best corn I've skied all year. It was fun. Thanks for the report. Where was your camp? In other words, where was the good corn? Surely not on the Easton? Maybe down low on the Squak? Mark, the good skiing is down low on the Squak, as you might have guessed. I have never seen it without quality snow just above the gullies. Scott Paul? (the immediate right) from Schreiber Meadows TH, and then let your instincts guide you. Thanks, Sky. I've seen poor quality snow on the Squak...in early October. Glad to hear it's surviving the heat wave in good shape. I figured I would add a few more details plus a photo. Our camp was located on a large flat beside a major waterfall at about 5800 ft. From the first major creek crossing at 5100 ft on the Scott Paul trail, the most direct way is to follow the creek right to the waterfall (we followed a moraine ridge just west of this). We skied right to/from our campsite. As for the route itself, the Squak Glacier is in OK condition crevasse-wise for August, we needed to belay only a single crossing during the descent (Sky schussed it unroped, the rest of us were belayed). 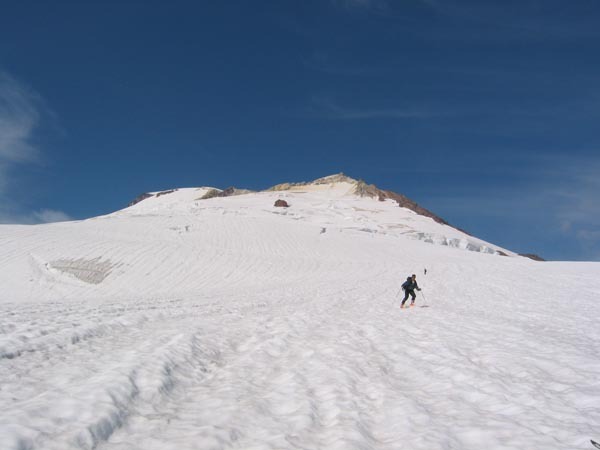 We also roped up for short sections during the ascent, David and I contoured west to join the Easton Glacier climbing route while the others followed the Squak to Sherman Crater. Both rope teams left the ropes at the crater rim and climbed the upper Easton unroped (a few obvious cracks are opening here on the headwall). The lower Easton below 8400 ft is heavily crevassed, it would not make a very good ski route right now (Squak is much better). As for the snow, I don't want to rain on the parade, but realistically the snow wasn't THAT great. I'd have to say it was only OK at best, and never very smooth even on the lower face below 7000 ft (certainly it was smooth compared to the deep runnels between 7000 and 9000). It was pretty good and certainly fun, but I've skied better corn on at least a dozen trips in June and July this year. I just don't want others to go to the Squak with unreasonable expectations after reading the above reports, and then be disappointed. As long as your expectations are reasonable, a trip here now will be worthwhile and fun. This photo shows us skiing down near 7000 ft on the Squak Glacier, with Sherman Peak above and the summit dome at upper left. Hey Amar, do you have any more photos? I thought the lower 1500 feet were great; then again, I haven't skied Baker before, so I don't know how good it can get. As you said, the runnels were not very enjoyable. Oh, well, it was still a nice trip. And in August, I'll take what I can get. That's right everybody, like Amar said, the skiing sucked. It was terrible. Don't go to Baker. Everybody, move to Colorado! I heard that Glacier peak is also not skiiable. So don't go up there either. Yeah, it's too bad we live in Seattle. I think Shasta is the place to be. Oh yeah, and Lassen! You can practically drive to the top! What's this? Is there dissing of Lassen & Shasta going on? The top of the NE face of Lassen was measured to be a respectable 48 degrees, and Shasta is so Shasterriffic that it needs no defense. Having just watched Gangs of New York, maybe the best way to settle this would be an old fashioned street brawl. I like the sound of a brawl....Maybe Jeff will join in, too!